Oxalis-Laser is a French company founded in 1995 by François Nesa, PhD in Physics. At that time, Oxalis-Laser was providing services to French companies involved in design of lasers and complex optical systems. Oxalis-Laser was recognized for its expertise in optical simulation. Today, thanks to multiple collaborations with French laboratories, Oxalis-Laser is able to provide a full package dedicated to lasers and complex simulation systems. Simulation is a powerful tool for time and cost reduction in optical system optimization. Therefore, Oxalis-Laser is also providing engineering services to companies which have not either internal skills or ressources for simulation. Oxalis-Laser's aim is to be recognized worldwide for providing efficient simulation package and services to companies and national laboratories involved in developing complex optical systems. Our goal is to anticipate customer needs by improving and expending our simulation capabilities through either internal development or in collaboration with companies and national laboratories working on cutting-edge developments. 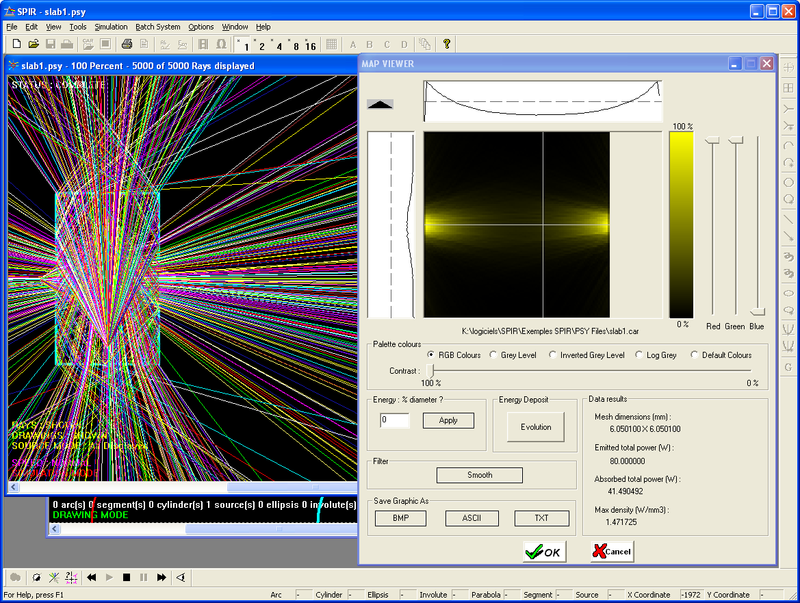 "Unique and powerful software for simulation in photonics"
Commod Pro is a general software that simulates the creation and propagation of coherent beams. It is Oxalis-Laser's leading product. The platform is constructed around calculation modes and generic components where calculation of propagation is based on the paraxial approximation. The main laser-matter interactions taken into account are : amplification, absorption, Kerr effect, birefringence and frequency conversion. Commod Pro is made to be both easy to use and exaustive in the way it handles physical phenomenas. It is also an open powerful software that can interact with external softwares. ThermOpt is devoted to simulate and to calculate wavefront distortion and polarization state change due to induced birefringence in a solid under heating and cooling. We know that the temperature gradient and stresses appearing in a solid can contribute to a significant alteration or change of the optical properties of this solid. 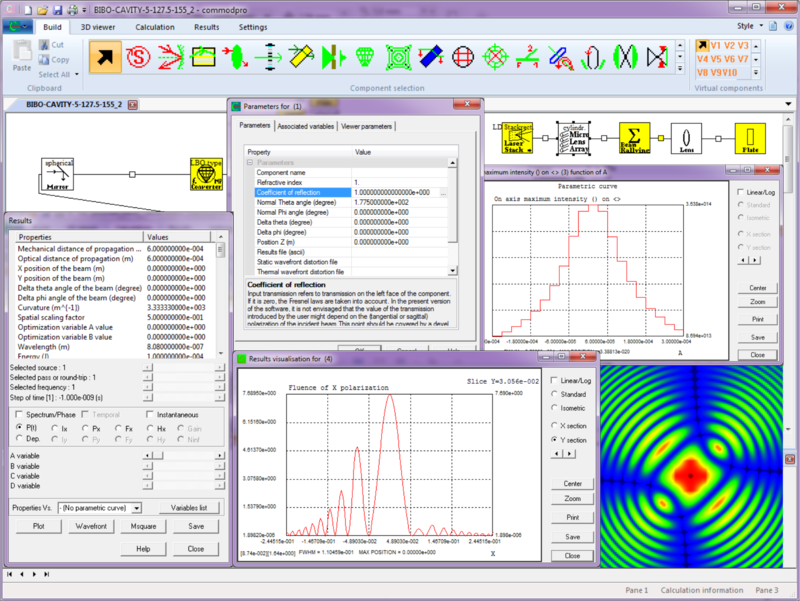 Thermopt is mainly a software interface between pure thermo-mechanical and optics softwares. The Graphical User Interface (GUI) offers an easy and intuitive way to setup all the parameters of a system. Spir has been developed to achieve optimization of the amplifier pumping in the scope of diode-pumped solid-state lasers. This interface is used to have a better control over the energy supplied and the spacial selectivity of the energy deposition on a system. The simulation is based on the non-sequential ray emmission using Monte-Carlo method. It takes into account effects like light absorption, diffusion and reflection. 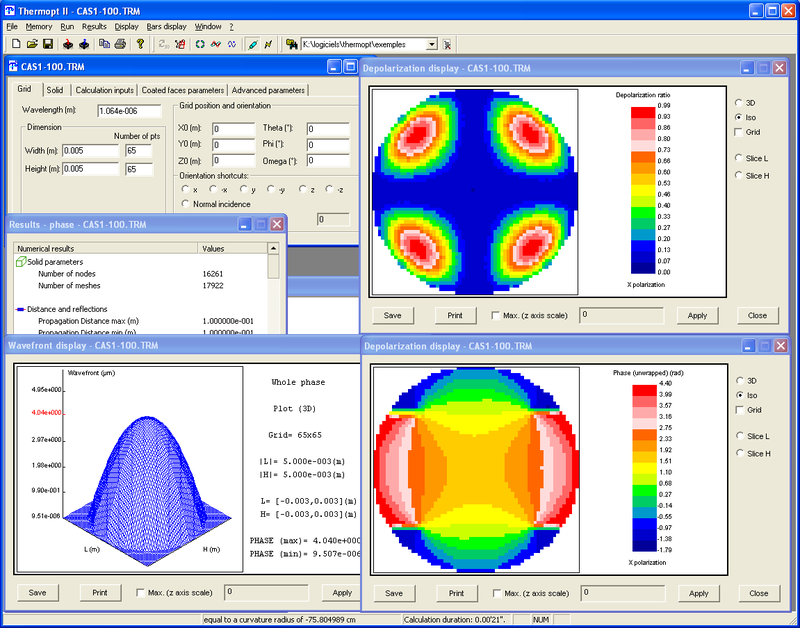 Resulting files after simulation can be then used in a laser simulation software such as Commod Pro. Simca provides a complete set of optic design and performs cavity ABCD simulation considering TEM00 mode and gaussian optical systems. Three calculation modes are used: linear, ring cavities and single-pass propagation through an optical system. SimCa can also performs parametric analysis. Oxalis-Laser provides Services based on its expertise in optical simulation and software development. For projects to get results. Because we know that optical components are expensive and experiments are long, simulation is the key. If ever needed we can support you in your projects, create new features in our softwares to fit to your needs or hold training sessions with your team. Thanks to our competence many project have been completes this way.